I LOVE Palladian Windows! Here is where I will insert some useless info about Palladian Windows that y'all may or may not have known. Palladian Windows are derived from Palladian Architecture which is a European Architecture derived from designs of the Venetian architect Andrea Palladio. Palladio's work was strongly based on symmetry, perspective, and values of the formal classical temple architecture of the Ancient Greeks and Romans. His work quickly became known as Palladianism. Now that I feel like I just finished a paper for my college Lit class I must give credit to Wikipedia for this vault of knowledge! 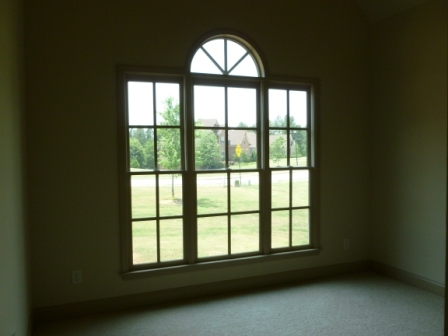 They have not one but two sets of Palladian windows in the new home. 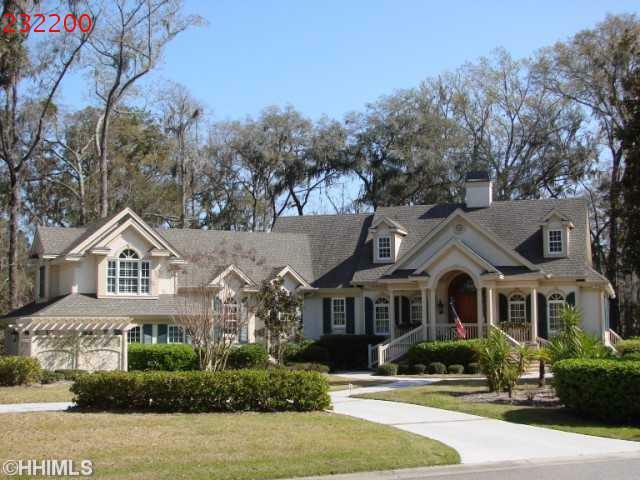 I would show ya the front of the house so you could get a better idea of what they look like but I am not sure they would like me sharing the front of the home so I am playing it safe here. All I have are these pics and this is their dining room. I am sure you can imagine what the windows in here pretty much look like. The ceilings are very tall. This is the other set in one of the bedrooms which I think would make a perfect sewing room for The Nana! 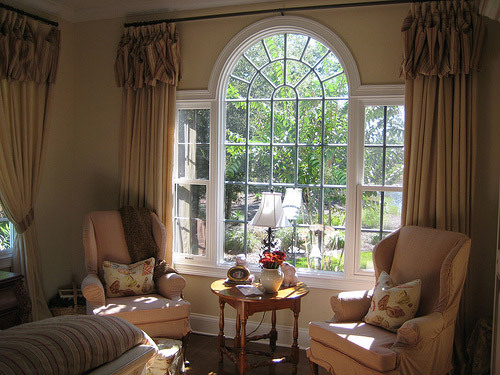 The Nana is stumped on what to do with these windows because it seems their casings are too thin for blinds to be added to the inside of the windows. The Nana sent me on a mission of sorts in hopes of finding some ideas on what she should do with these windows. I will say that it appears most people leave their Palladian windows uncovered for the most part but I know that will not fly. This would have been an option but again it seems blinds/shutters will not fit inside the window frame. I found this idea but one I think it is too froufrou for The Nana and secondly does not really help the fact that the actual window would not be covered yet again because of the depth factor. This idea is a great one as well but again no actual covering of the said windows. The Nana likes her windows covered! The Nana mentioned just adding a rod across the middle of the windows and honestly that is exactly what we did in our first home in our dining room with our Palladian window but her ceilings are much much higher than ours were and I think that if she goes with that option it will drag the room down too much. Here is an example of the rod being hung higher. This option will allow her to not only be able to pull the drapes closed at the end of the day but she will also be able to ...choke choke....add blinds on the outside of the windows and nobody would even notice. Even without blinds hung I think that this is the best option. For the bedroom I think that hanging the rod right under the arch would be fine since the windows in there seem very tall but the ceiling shorter. Keep in mind though that the center of the rod may drag after awhile because there does not seem to be any room for a center support. We had that issue. 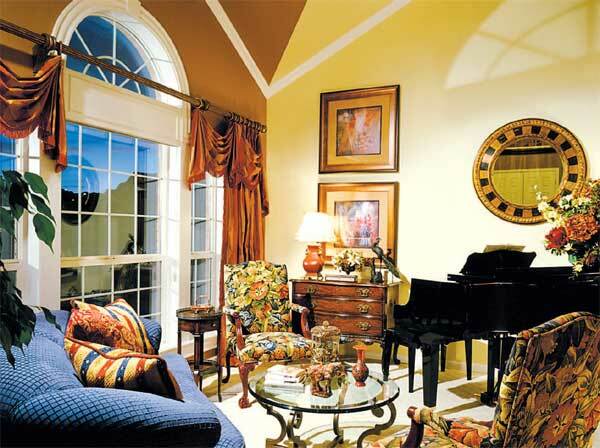 Do you have Palladian Windows in your home? If so how did ya dress um?? Beautiful pics, Pamela! 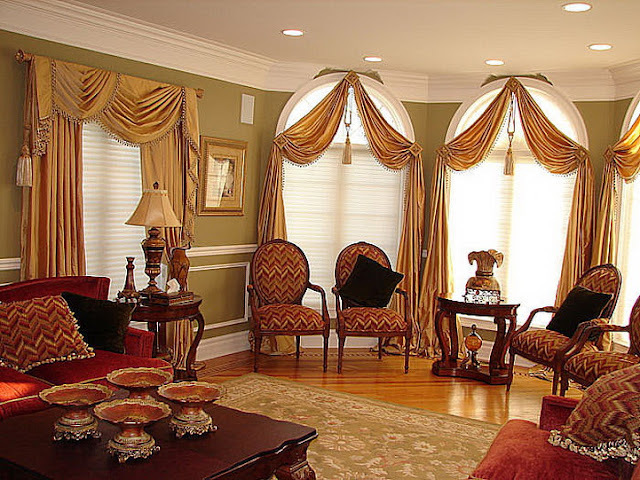 I love the drapes hung above the window but have it going just under ours - we call it an "eyebrow" window because it runs the width of our two double hung windows and is a separate piece from them. 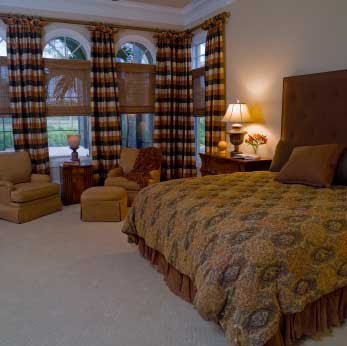 I like the bedroom with the plaid drapes and would probably go that route myself. They do make rods for those palladian windows. I think JC Penney carries them and the sheers that go inside the window. 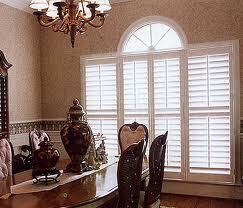 Pamela, I have one on the front sitting room and one in my great room and neither one are covered. I love these windows too and that is why we had them added to our house. Oh, I also have a small one over the front door. Those windows are so beautiful, it seems a shame to cover them. Charming yet classic, indeed! 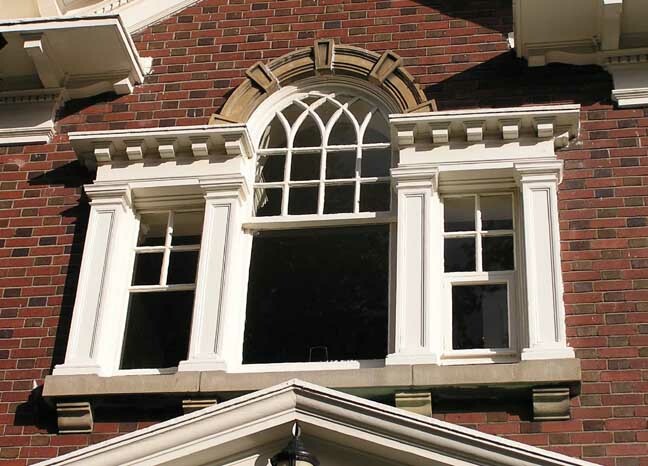 Your house will look better with those Palladian window styles. Though they look simple, the aura they give from the outside is outstanding. And when you take a look from the inside out, you'll really feel added value these windows bring.